The town of Ambalangoda in the Galle district in Sri Lanka is known for the renowned ‘Devil’ mask dances and the views of the Indian Ocean. Although, the place sees lesser tourists visiting its shores, if it is a quiet and calming holiday you are looking forward to then Blue Parrot Villa is the perfect spot. Besides a few fishermen and children, you have yourself and your loved ones to enjoy with. Take your time and relax in the tranquility afforded by this town, as you relish the villa’s rustic and authentic Sri Lankan charm and who knows, you might be lucky enough to witness an actual mask dance! Two, well-furnished and air-conditioned bedrooms are available to guests at the villa. The master bedroom is furnished with a canopied king-sized bed, featuring sheer, white drapes that are perfect for a good night’s sleep. The second bedroom is furnished with king-sized bed and single bed complete with mosquito nets. There are writing desks in each of the bedrooms, in case you wish to tidy up some work. The bathrooms that is fully-equipped with amenities, and sports a similar rustic design. It is equipped to provide solar hot water as an environmentally friendly initiative. 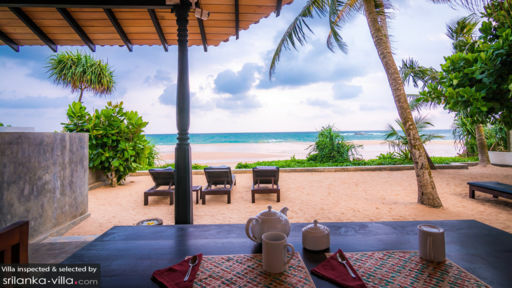 The Blue Parrot Villa offers guests the chance to have the entire beach to themselves, as the villa extends out to its sandy shores in the most glorious way. 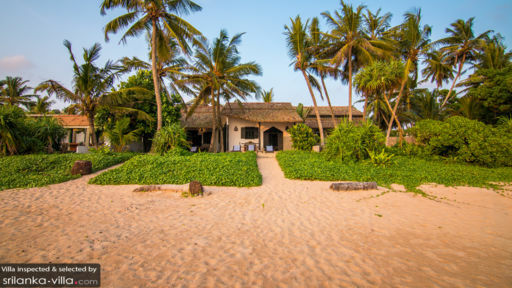 You simply have to walk down to the sandy coast and enjoy endless views of the Indian Ocean, as the tide rides high or low depending on season, swim to your heart’s content, sunbathe and lounge on your beach towels without any disturbances. With swaying coconut palm trees fringing the periphery of the villa, and lush greenery on the gardens, this is a restful and relaxing spot for anyone to enjoy a holiday with friends and family. With a rustic aesthetic in its interiors and quarters, the villa prides itself in giving you a holiday home that celebrates the heritage of Sri Lanka within its walls. There are polished cement dividers in the living area, for an antique ambiance, wooden ceiling, and whitewashed walls. With antiques lying around, you will feel at home and at ease while you relax on the comfortable sofas. A library lined with bestsellers collected with care over the years is at your disposal! The black, wooden doorway leads to the terrace which has been furnished with a dining area, overlooking the stunning panorama encompassing the ocean and the vast skies. There is ample lighting in the living area casting a cozy glow in the room to create a nice ambiance for everyone to relax. The kitchen is an open-concept and is fitted with all the amenities and modern appliances with a kettle, toaster, stove etc. The villa staff is there to assist you if need be as they provide daily housekeeping service, and even get your laundry sorted upon request. If you wish, the staff can help with excursions, making bookings for trips and even arranging for a chauffeur-driven car. When you are satisfied with the beach, try out some of the local shops in Ambalangoda as well as the historical sites that impart information about Sri Lankan heritage. There are the turtle hatcheries, batik factories, and the local temples that are must visits. Learn about the art of toddy making and taste the locally-grown fruit from street-side vendors! We had an amazing family holiday and the villa is in a perfect location away from the over commercialised beaches but still close enough to everything. We loved the location with the beach just outside your doorstep, watching local fisherman especially. The villa has character and is very comfortably set up with everything you need. The best aspect was having our lovely dinner prepared by staff at the villa while watching the beautiful sunset over the sea. Everything was taken are of at the villa by the staff and the food prepared for us was lovely. They went beyond all expectations doing things for our kids especially. They provided a fantastic birthday cake for our son's eighth birthday and made it a memorable occasion. Sudath was very helpful with recommendations and suggestions and an impeccable host. We had an amazing family holiday and our kids loved it, we will definitely be back. Can't recommend this villa or host enough. We were there for two weeks and we could really relax there! The beach is wonderful and nobody will disturb you. We were two families with children and therefore it was a perfect fit with the two luxury and well equiped houses.... Our family booked the Blue Parrot Villa.... There are Ladys who make you free breakfast and we enjoyed it at the great terrace in front of the beach.They cooked and washed for us. We loved to use the service that they offered tasty meals for small money for lunch and dinner! They really care about you and not to forget they keep it very clean. The manager Sudath is a nice guy who can give you advice for tours nearby (ask about the laguna tour) and he knows a solution for every problem. Our children loved to play at the white sandy beach and we really enjoyed to swim in the warm ocean, this was what we were looking for..... It was a unforgettable holiday and we will come back soon in this little paradise! My family and I stayed here some time ago. I never got around to writing a review about this place. From pick up the airport right to the end of our vacation all was fantastic. The decor in the bungalow is very tasteful. It has two bedrooms with AC. Both bedrooms adjoin to the bathroom. The terrace just as you walk out the main entrance is an excellent place to sit in the evening and watch the sun set. Listen to the ocean, talk, play board games, read. It has great WiFi and the added benefit if you have a mobile with a local number...when our credit ran down; a quick message to Sudath and we could call again within minutes. The food. We had breakfast each morning. Bread. Eggs (fried or scrambled) lots of fruit bananas, pineapple and melon. Toast. Coffee and tea. This was served around 8.30 to 9am. We also had dinner in the evening. Mostly fish or chicken curry with rice. The price for dinner was very reasonable. The food was always hot to warm. Never ever cold. The on site security and staff were polite and couteous. So what makes this place work so well? The price is very reasonable for the great service you get. For example on a full moon day you are informed the night before that if you want chicken or meat you should make the order because on full moon day many places don't sell meat. Secondly, it's how it's all presented and completed right down to the cleaning of the house. You never feel imposed upon. I stayed in one other place but in comparison I would not hesitate to book here again. It's great for a family 2 kids. Also what I liked a lot was the house book. In the house book you can find information about transport costs, ordering dinner etc. Everything is clearly presented. What else can I say? Communication with Sudath was very easy, by email and whatsapp. In addition, Manju (tuk tuk driver). With local phone from Sudath we could explore Galle and many other places and then just call Manju and he would pick us up. For sure we always told Manju approx time and we would call him 30 or 40mins before we planned to leave.